The WMS-16 series has been discontinued. Please see the WMS-25 as a possible alternative or contact our Flow Engineering department. 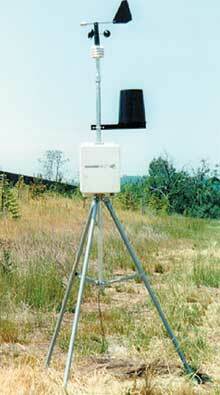 The OMEGA™ WMS-16 Modular Weather Station is a computerbased meteorological system designed as a “user friendly” solution for data storage and real-time monitoring of weather conditions. The standard package includes: wind speed, wind direction, air temperature, relative humidity for temp/humidity, barometric pressure, precipitation, data logging, tripod and mast, solar radiation shield, cables and mounts. Additional sensor options include solar radiation, water or soil temperature, auxiliary air temperature, or rain gauge upgrade. The unique modular system design provides plug-and-play functionality for adding or replacing sensors. The WMS-16 is supplied with an attractive desktop data acquisition module with a memory capacity of 128KB RAM (approximately 45 days at 15 minute intervals with 6 sensors). The WMS-16D data acquisition module includes selectable averaging intervals, 12-bit analog conversion, 0.1% F.S. accuracy, 2 alarm outputs, and optional modem communications. The standard system includes a 120 Vac power adaptor and RS232 serial port for connection to a personal computer. For outdoor or remote applications, a NEMA 4X enclosure and rechargeable battery option is offered. The optional software package provides a real-time text display, as well as a real-time graphical display, or an ASCII row and column format may be selected. In addition, the data acquisition module is compatible with Windows HyperTerminal software and other terminal programs. Nota: * Note: Standard length for all cables between base unit and sensors are 40 feet. To order items with longer cable length add a suffix "–Xft" where X is length in feet, and add $1 per cable per foot per sensor.